Reprinted from Medium with permission from the Bill & Melinda Gates Foundation. Allan Golston visits with students at the Earl Boyles preschool. Principal Ericka Guynes could see the problem clearly. Students at Earl Boyles — a Portland, Oregon elementary school where more than four-out-of-five students are eligible for free or reduced-priced lunches — were starting kindergarten at least a year behind where they needed to be, socially and academically. And data showed that despite the school’s best efforts, gaps that started before kindergarten were persisting into later grades. The question was what to do about it. “Students are now coming into kindergarten where they need to be, and we’ve actually had to adjust our curriculum and increase the rigor in later grades because our students are ready to learn at that level. 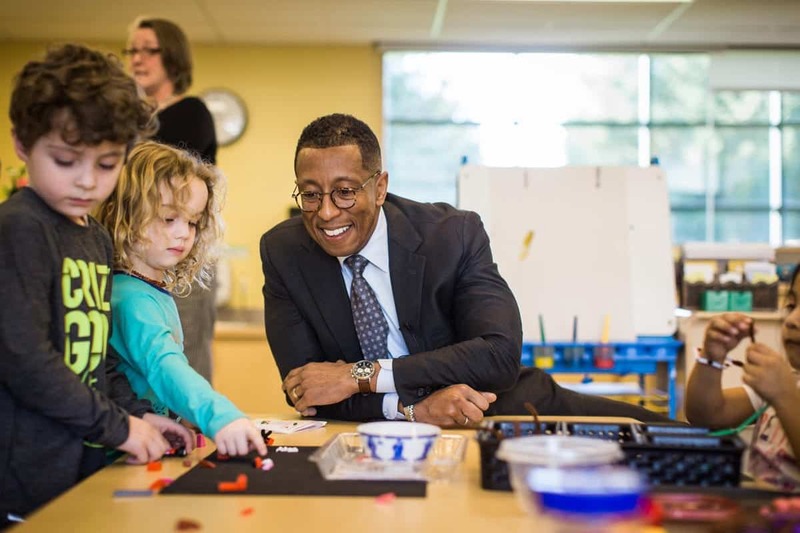 It’s ever-evolving,” Principal Guynes explained to me during a visit to Oregon to meet with early learning leaders last month. Visiting with Principal Guynes and meeting with some of the teachers and parents at the school, I was inspired by the progress they’ve made, as well as their commitment to meeting the needs of their community and ensuring that students are starting their educational journey on the right track. Currently, 1.5 million children are being served by state Pre-K programs across the country, with another 730,000 4-year-olds enrolled in Head Start. And as governors from across the country gather in Washington, D.C. this week to discuss crucial issues facing states, I hope they will spend some time discussing ways those children can be better-served through consistent, high-quality Pre-K programs. While the majority of our foundation’s investments are directed towards supporting secondary and post-secondary student success — particularly among low-income families and students of color — our Early Learning strategy is centered on learning and codifying strategies for improving quality of state-administered Pre-K programs. We are doing this work in partnership with Washington State, Oregon, and Tennessee. As we work with partners to improve the quality of Pre-K programs in those states, we hope to learn best practices and share those lessons with other states. Based on work we’ve done with researchers, program leaders, advocates, and other funders, we have a much clearer sense today of what it means to be a “quality” public Pre-K program. Certain program elements — things like a strong curriculum and positive interactions between children and families — help secure lasting gains for young learners. When these elements of quality are in place, it makes sense to maximize public investment. 1. Increasing funding for Pre-K is great. But increasing predictable, streamlined, and sustained funding for quality Pre-K is even better. While many states are increasing funding for Pre-K, early learning programs across the country don’t have the resources to improve their quality. And where there is funding in place, the complicated nature of tangled funding streams across federal, state, and district dollars both increases unpredictability and puts a large administrative burden on school staff — which can detract from emphasizing quality. 2. Support early learning educators with professional learning opportunities. The low wages Pre-K teachers are paid, coupled with the expense of continuing their education and certification, often leads to many Pre-K educators leaving their classrooms in pursuit other opportunities. As a result, we’re losing lots of great Pre-K teachers across the country. States should prioritize professional learning for educators that can help them grow, earn degrees, and continually improve their craft, which will make it more likely they’ll stay in Pre-K classrooms. 3. Use data not just to track compliance, but to drive improvement. The story of Earl Boyles Elementary reinforces the power of providing leaders with quality data they can use to engage their community and improve the type of instruction students receive. Pre-K program providers, K-12 schools, and communities can similarly use data to “connect-the-dots” and show how students are doing as they start kindergarten, how they progress from grade to grade, and to make sure that the social, emotional, and academic gains students receive in quality Pre-K programs are being sustained over time. Research has shown that if students receive a high-quality Pre-K experience that includes strong teacher-child connections, skilled and supported educators, and a strong curriculum, they are far less likely to fall behind in the first place. They are also more likely to read earlier, graduate from high school on time, and are more likely to go to college. School leaders like Ericka Guynes and the team at Earl Boyles are making those opportunities a reality for their students. I hope state leaders in D.C. this week explore how they can do the same.